This is one of the more historically significant Dodger related collectibles you'll ever run into. 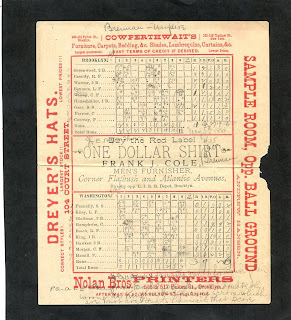 Below is a vintage 1884 scorecard from the very first professional ballgame on May 5, 1884 at old Washington Park, the former home of the Brooklyn Baseball club. 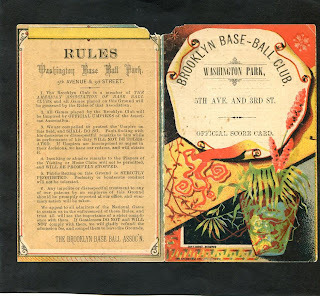 As you may know, the team started as a minor league team in 1883, moved to the American Association (becoming a major league club) a year later in 1884, then the National League in 1890. Anyway, it is for a game between the Brooklyn Atlantics and Washington Statesman. The Dodgers won this game 11 to 3, but would finish ninth that year. What's even better is that it originally comes from the estate of Henry Chadwick, the father of Baseball. He is a Hall of Famer noted for creating the box score and scoring methods used by fans then and today. It is written in his own hand and includes numerous notes about the game. See the auction item here at Brockelman and Luckey's current Auction.